Find your inner calm. My co-founders and I deeply believe in meditation. I really see it as a human superpower. I’ve found that meditation helps me slow down and it’s especially useful before stressful situations, like investor pitches or keynote speeches. It gives me a chance to collect my thoughts and avoid panicking no matter how chaotic a situation is. Being in a leadership position, it’s important to control your tone and delivery and I’ve found that meditation helps with my awareness of both. I had the pleasure of interviewing Natalie Gray, Co-Founder & Head of Product at Cover. Having started her career in the New York fashion industry, Natalie’s transition into the insurance space was an interesting one. She is currently responsible for front-end design and product at Cover. Natalie was selected for the Forbes 30 Under 30 in 2017 and she is a Y Combinator Fellow and Alumnus. My path to entrepreneurship was very non-linear. The tech industry simply didn’t exist like it does today when I was graduating; the iPhone had just launched, being a YouTuber wasn’t a viable career and AI was classified as science fiction. It was the height of the recession and it was especially difficult to find a job in Canada so I moved to New York City. I ended up working at a major marketing firm, mainly with fashion brands. My time in NYC was formative because it showed me that if I couldn’t find the job I wanted, I could create it. Funnily enough, the longest jobs I’ve ever held are the ones I created for myself. In a series of events that lead me back to Canada, I reconnected with Karn (CEO) and Anand (CTO) who were interested in partnering with fashion brands and I offered to help. The short version of this story is that I took the opportunities that were presented to me as they came along. One of the most interesting things that happened to us was getting accepted into the Winter ’16 Y Combinator batch when Cover was only in its idea stage. With our prior company, Stylekick, we submitted carefully crafted applications to Y Combinator and were interviewed and subsequently rejected three times. They liked us as a team but they didn’t see enough innovation in our product. When we applied with the idea for Cover, we had an app with only four buttons — the minimum viable product. This time, we took things a little less seriously and really focused on conveying our excitement and it worked. I don’t know if I’d call them funny only because as an early-stage startup, these mistakes can be exceptionally costly. Any mistake you make is an arm’s length away. In the fintech industry, a lot of what you’re selling is trust and and confidence so I’ve never really taken my mistakes lightly. That said, I’ve definitely learned from them. It depends on what area we’re addressing but as you scale a company, I learned that my priorities needed to adapt. When you’re early stage, the most important thing is your product and the numbers but you eventually get to a point where it’s about your people. I learned that although I can push myself to work at 110% capacity, it’s more impactful if I have a room full of people working at 80–90% capacity than if I were to push myself to the point of breaking. At our core, we’re a tech company which is unique within the insurance space. Our team is largely made up of people who have previously worked in the consumer tech space so we’re not approaching insurance the same way as a traditional insurance carrier. We’re approaching it as an experience and one that factors in the emotional decisions that come with purchasing any product. We are continuously looking for ways to improve our customer’s relationship with insurance through making each touchpoint with Cover a positive experience both with product and service experience. From a product perspective, our current model is the perfected version of our idea from 2 and a half years ago. Our major focus right now is to redesign the product to match the company we are today, rather than the company we started as. We see the upcoming shifts as a natural progression for the company and the goal is to offer a more holistic buying experience in-app. As our team has grown to nearly 40 people, I’ve learned that making an effort to be present is incredibly important. Sometimes it can be as simple as giving your undivided attention to a Slack conversation for five minutes, but it might also mean blocking off one hour to grab a coffee. By giving people adequate facetime, you’re able to make genuine connections with your team and foster open communication, both of which make for a more enjoyable and productive environment. One of the most important pieces of advice I’d give is to be cognizant of imposter syndrome. I think a lot of women struggle with it, myself included. If you’re chosen to do a job, just remember that you were chosen for a reason. Finding our authoritative voice can be challenging when you’re told to suppress that voice in broader society. It’s okay to make progress at your own pace but make it a priority. I had teachers in each stage of my life that deeply impacted me: my grade 5 homeroom teacher, Mrs. Cathcart; my high school art teacher, Elizabeth Watson; and my math professor, Prof. Graves. At each of these turning points in my life, they gave me the confidence to know that I could be more than what I imagined. I’m thankful that I was able to have that kind of encouragement in times where I really needed it. At Cover, we’ve tried to dispel the myth that insurance isn’t part of a financial empowerment toolkit. By making a user-friendly platform, it’s a joy to know that we can make information about insurance more accessible to people. On a personal front, I’m proud of my visibility in the tech industry. 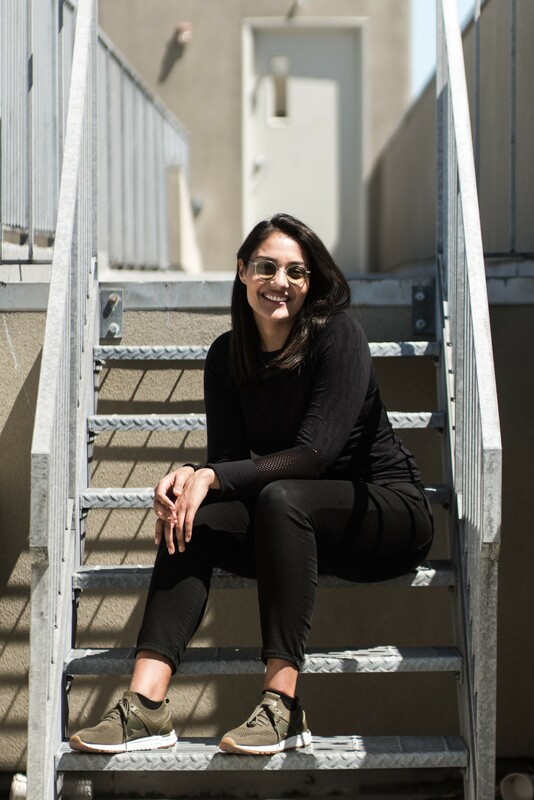 I remember seeing Sukhinder Cassidy fill an executive position at Google and thinking about whether tech could be a viable career path for me. Admittedly, it was not so much that her story resonated with me but just that there were so few intersectional people in leadership positions. It’s important to share our stories, especially as women of colour, so young people can see themselves in these roles. Lesson #1: Don’t gear shift. In a startup, you’re likely to wear many hats all at once. You may be involved in hiring, marketing, office management, biz ops, fundraising, product design and more. It’s easy and tempting to gear shift, but one of my most valuable lessons was learning how to prioritize and focus. I’m a big believer in the Pomodoro method: you set a timer for 30 minutes and finish as much of the task as you can in that time. I remember my math professor telling me that “you can do anything hard for 30 minutes,” and that really stuck. Lesson #2: Find your inner calm. My co-founders and I deeply believe in meditation. I really see it as a human superpower. I’ve found that meditation helps me slow down and it’s especially useful before stressful situations, like investor pitches or keynote speeches. It gives me a chance to collect my thoughts and avoid panicking no matter how chaotic a situation is. Being in a leadership position, it’s important to control your tone and delivery and I’ve found that meditation helps with my awareness of both. Lesson #3: Set a hypothesis and stick to a timeline. With Stylekick, we plugged away for 2.5 years before we were bought into Shopify. We were emotionally committed to the idea and weren’t able to be objective. We didn’t set a hypothesis or decide on a “hard stop.” An example of this would be saying, “We’re gonna work on this for 6 months and if we don’t see progress, we need to shift strategies.” I wouldn’t do the whole experience differently because I learned so much, but what became clear to me that solving the problem is what you should be married to, not the solution itself. Lesson #4: Know your problem. It’s impossible to be prepared for every possible situation but being methodical in how you solve problems is especially important when you’re leading a team. In the case of product, there are infinite solutions but there should only be only problem you’re solving for. The following 3-step method tends to help me step back from a problem: assess the severity, ask as many questions as you can to understand it and then make a reasonable decision. Lesson #5: Be self-aware and never stop learning. The final lesson I learned, and arguably the most important one, is to make sure you’re continually learning. Learn to crave critical feedback and don’t shy away from it. Whether it’s about your leadership style or the product you’re putting out, you want to make sure people genuinely like it. Also, know what you’re good at and what you’re not good at. When it was the four of us in a house, we had to do everything. It was such an exciting step when we were able to hire people who are experts in their field and better than we could ever be. I want to work with people who would absolutely school me in whatever it is they do best. One of the things that immediately springs to mind is emphasizing the importance of being mindful with one’s money. My passion about this topic was triggered by working in fashion and subsequently creating a shopping app. It’s crazy to realize that clothing makes up 80% of the world’s landfill and we just keep buying more and more. Federal elections only happen every four years but every day you’re casting a vote with your dollar and the companies you choose to support. It’s worth doing your research, not only for your own financial empowerment but for what it means for the broader community. I think I’ve been most impacted by the notion that you can’t control anyone else’s actions but your own. As a leader, it’s so important to reflect on how your actions impact the team. Instead of trying to change someone else’s behaviour, look at your role in the situation and how you can improve instead.